Actor Alec Baldwin's impression on Saturday Night Live of Donald Trump tricked a national newspaper into thinking he was the real thing. 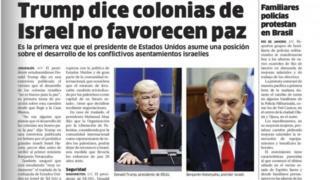 El Nacional in the Dominican Republic has now apologised for accidentally publishing a still of Alec Baldwin, captioned as the US president, next to Israeli PM Benjamin Netanyahu. The image accompanied an article about Israeli settlements. The paper has said sorry to readers and "anyone affected". The picture was sent to the newspaper along with information about Saturday Night Live, the long-running US satirical programme. No-one spotted the mistake, says El Nacional. Saturday Night Live is not Mr Trump's favourite TV programme. He says Baldwin's frequent impressions of him "stink". "Not funny, cast is terrible, always a complete hit job. Really bad television!" he once tweeted.